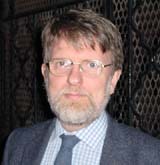 Cormac Millar is the writing name of Cormac Ó Cuilleanáin, who teaches Italian at Trinity College Dublin. Born in Cork in 1950, Cormac is the son of novelist and children's writer Eilís Dillon, and brother of the poet Eiléan Ní Chuilleanáin. Having studied the violin in Dublin and Rome, he went on to university studies in Dublin, Cambridge and Florence. He has been involved with literature and the arts for a number of years. He was chairman of the Dublin Arts Festival in the 1970s; later he served as chairman of the Irish Translators' and Interpreters' Association, and of the Irish Writers' Centre. A former winner of the John Florio Prize, he teaches on undergraduate and Master's degree courses includinng Literary Translation and Comparative Literature. He is active in CLAI - Comparative Literature Association of Ireland. Among his academic publications are studies of Dante and Boccaccio. He was co-editor, with Michael Cronin, of The Languages of Ireland. His crime novel, An Irish Solution, was the first work of fiction to be published by the Penguin Ireland imprint. His second crime novel, The Grounds, was published by Penguin in 2006. His latest academic books are co-edited volumes, Translation and Censorship (2011) and Translation Right or Wrong (2013). Cormac is married to Phyllis Gaffney; they have two daughters, a son, and two grandsons. The surname Millar was chosen for its euphony and compact length, and as an hommage to Ross Macdonald (1915-1983), one of the masters of the mystery genre. Ross Macdonald was born Ken Millar, in Los Gatos, California. His private eye Lew Archer treads the well-worn footsteps of Chandler's Philip Marlowe. Among Ross Macdonald's many fine books are The Galton Case, The Zebra-Striped Hearse, and The Far Side of the Dollar.